If you are looking for a peony with blossoms that are as white as possible, you are looking for Madame Claude Tain. 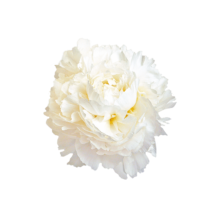 Because of its colour, this peony is extremely popular during the wedding season. Madame Claude Tain is a lush, white peony with large, full flowers and a sweet scent reminiscent of lily of the valley. The size depends on the amount of light received during growth. Because of this, peonies from France and Italy can be larger than Dutch specimens. Madame Claude Tain blooms later in the Netherlands than it does it in France. This means that there is a period when this peony is unavailable. This peony was bred in 1927 by the French breeder Doriat, who also bred the popular Odile a year later. Madame Claude Tain is considered by many connoisseurs to be the best white cut flower because of its full flowers and its white bud. Madame Claude Tain does not open when it has been cut too early. The bud will stay green and firm. Buy these peonies at the right maturity. You can look forward to a vase life of about ten days.